Or, You can get the 2 DVD Combo Set of Greeter Training DVDs. Too much talking, give me a list of details that we, as greeters should be doing or saying. Thanks Linda for the observation. 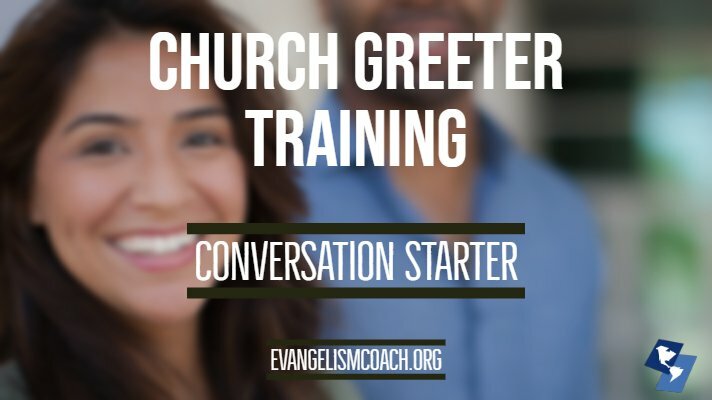 The point of this exercise is a discussion starter for the team of greeters about what they might want to be doing, saying, or praying for ways to serve real people who may have one or more of the questions raised in the clip. I appreciate the speaking but like Linda, give me a list of what greeters and ushers should do and say. I also agree with the vision refresher instead of training,because many folks don’t show especially the older ones. Thanks Chris – great video and discussion starter! I think I’m actually glad you didn’t give me a list of things to say because I’d like my teams to watch this, allowing them to come brainstorm together our “do’s and don’ts” based on our churches unique demographics (ethnic, economic and spiritual experience.) I will be showing this clip to our team, and asking them to come up with the answers – I love how it really gives you the perspective of a first time guest. We have a Guest Services, different from usher/greeters, who actually look for guests and welcome them, personally assisting them (showing them to the children’s area, cafe, restrooms, worship center, etc.) to the comfort level of the guest. Our greeters are also trained to recognize and handoff guests to people on this team. It seems to be working well. I also find that in today’s world of technology, most peole visit our website first. There they are able to get a more defined idea of what our church is about, and find answers to their most frequently asked questions. One more thing – love the “Vision” idea! I have three meetings a year: emergency plan, training and appreciation. I do vision casting at each and out of 200 volunteers, I normally get around 120-130 people present. (This is seriously good considering it’s another “night out” for most people.) I am also going back to my bi-monthly orientation for new members so they get the proper amount of vision and casting and trainaing from the start. Also, it helps to have great team leaders, which I do!! Chris, good stuff. I wonder, though, about the reality of the video … who bothers to keep the four-pound Yellow Pages book anymore? Most of these questions could have been answered on a well designed church web site. On the other hand, those questions are exactly the ones first-time guests will be pondering. Key point: remember the church website doesn’t exist for members, but for potential guests. It’s the best marketing tool the church has, other than Word Of Mouth (sometimes called evangelism). IMHO. the best greeters are genuinely friendly, outgoing sorts of folks who have “never met a stranger.” They intuitively know how to start and carry lite conversation with those in their proximity and rarely need much training. They are founts of information, but know not to spill it all at one time. On the other hand, when they engage a visitor they make sure the guest knows where the three most important rooms are (restrooms, worship center, nursery … the last as needed). Otherwise, their job is to disarm, charm, and warm guests and members with graciousness. On the other hand, there is a single bullet point for “What to say” if you’re an usher. The most important key line for ushers is: “Do you have a seating preference?” If an usher’s primary job is handing out bulletins, buy a table and a “Take One” table tent for each doorway. Ushers ush. They know where the most comfortable seats are for those who need to be warm. They know where the cool spots are in the auditorium. They know where to seat the hard-of-hearing and those with vision impairment. And most important, they know where the empty seats are and have the moxie to say to Ms. Crabbytree “Would you slide into the middle of the pew? We have guests” so that the guests (or the late-coming members, for that matter) don’t have to navigate feet, purses, diaper bags, coffee cups, and most of all laps as they crawl over people to get a seat in the middle of the pew. Oops. Didn’t mean to climb up on a soapbox. Chris, good ideas here. I hope people are listening and responding well. It only takes one hospitality misstep to convince a guest to not return.